Like many families with young children, we spend many weekends during the summer lounging on the beach. 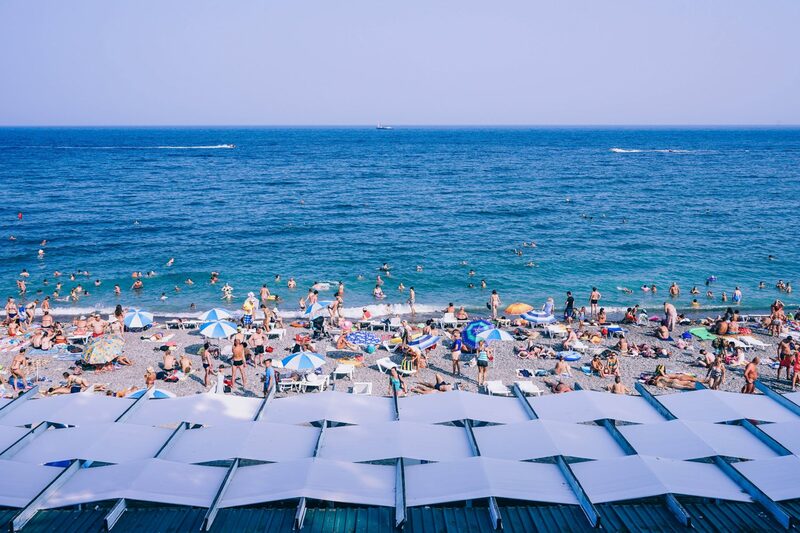 Between the hot sand and the cool water, the beach creates the perfect environment for parents to relax while giving the kids an opportunity to get out and play. Of course, no trip to the beach would be complete without some essentials like towels, toys, and snacks. 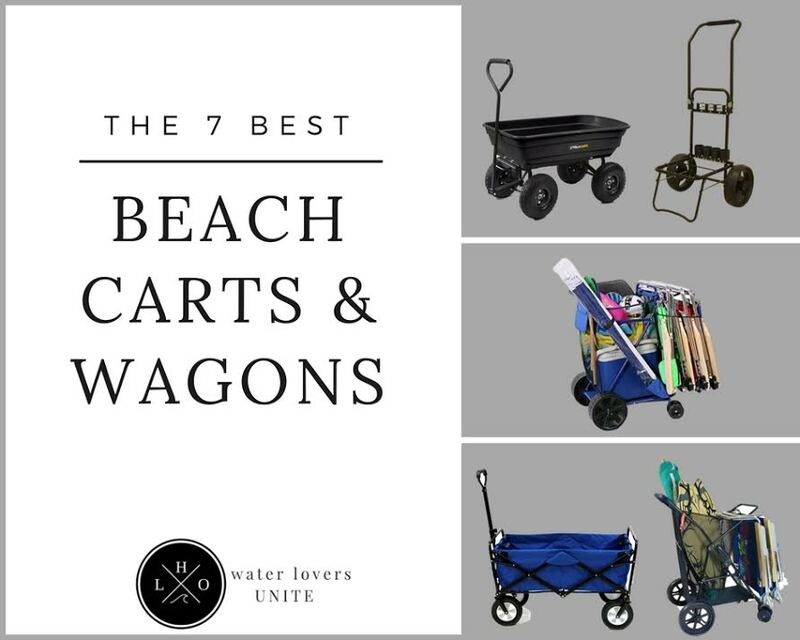 Our family used to carry these items in multiple bags and coolers until we discovered an innovative product: the beach cart or beach wagon. These spacious carts on wheels make it simple to haul around beach chairs, umbrellas, toys, and other must-have items without putting excess strain on your muscles. Most beach carts are designed with large wheels that won’t bog down in sand or mud. 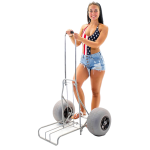 The best beach cart or beach wagon is durable, collapsible for easy storage in the car or garage, and has big wheels that will easily glide over sand. After testing several top-rated beach carts, here are the best beach carts and beach wagons. Our top all around beach cart has everything you’re looking for in a beach wagon including a durable metal frame, extra-large wheels, an easy-to-clean fabric, and a great gripped handle. 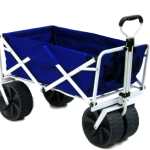 The Mac Sports Heavy Duty Collapsible Folding All Terrain Utility Beach Wagon Cart is available in two color combinations and offers tons of storage in a compact cart. The wagon opens up to about 36.2” x 21.4” x 24.6” in mere seconds. No assembly is required. The heavy-duty frame can haul loads up to 150 lbs. and includes an adjustable handle to make transferring your beach gear a breeze. You’ll also find two mesh cup holders that keep your beverages secure as you walk. The extra-large wheels are perfect for sandy environments and easily glide through soft sand. 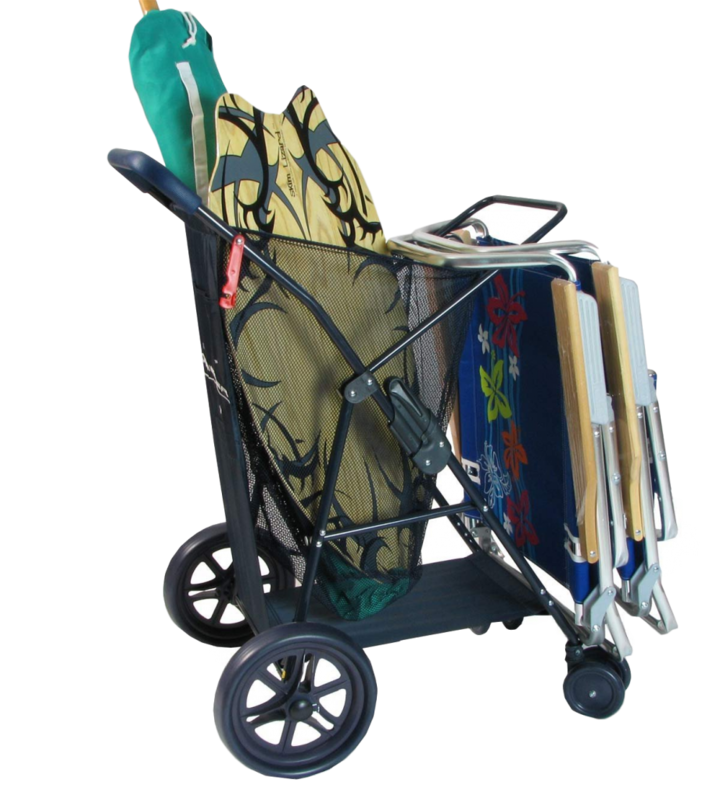 In addition to the beach, the cart is great for outdoor sporting events, picnics, and concerts. At the end of the day, the beach cart folds up to only 9.7” thick. The folded size measures just 31.5” x 21.4” x 9.7”, which is the perfect compact size for storage in your garage or the trunk of your vehicle. 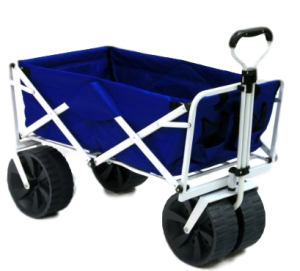 If you want to make your trips to the beach even more relaxing, consider a high quality beach cart like the Mac Sports Heavy Duty Collapsible Wagon. 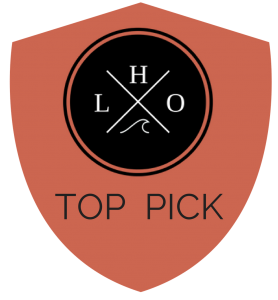 Our top heavy duty pick for the best beach cart for soft sand is the Challenger Mobility Folding Beach Cart – it rolled over the softest sand with ease – even when loaded full of beach gear, including a cooler. This beach cart is a lifesaver for families who regularly go to the beach and prevents you from having to make multiple trips from your car to the waterfront. Its large detachable beach balloon tires also make wheeling over soft sand a cinch. The wheels measure a whopping 11.8” x 7”, making them the perfect size for sandy surfaces. 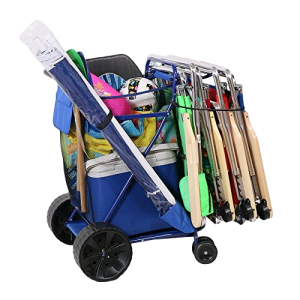 Of course, storage is key when choosing the best beach cart for soft sand. After testing the Challenger Mobility cart, I found it to have more than enough room to carry all my adult and kid supplies. The bottom platform folds in for easy storage then folds back out to load chairs, coolers, towels, umbrellas, and other beach essentials. With a total weight capacity of 165 lbs., you won’t have any problem hauling everything you need. 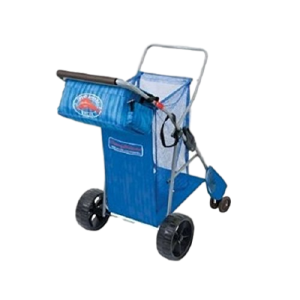 Pulling or pushing this cart requires minimal effort thanks to the telescoping handle which has an adjusting height of 29” to 49”. The platform of the cart is also sufficient for most family’s needs, measuring 14” wide x 14.5” deep. The frame is made of tubular steel to ensure long-term use, and covered in an epoxy powder coat that gives the cart a sleek, finished look. 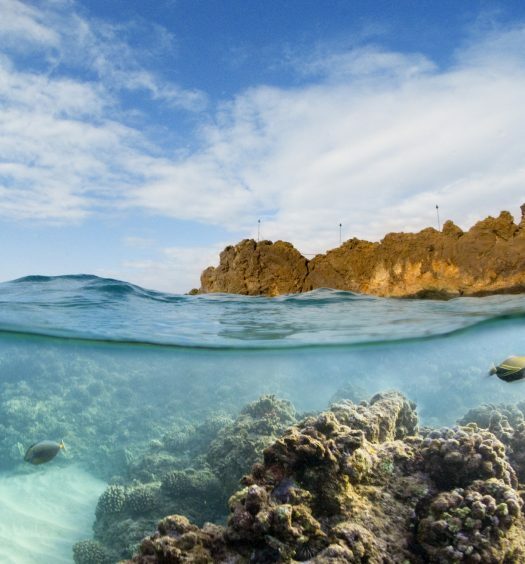 No more dredging through the sand! Next on our top picks list is this wonderful, light and spacious cart by Rio Brands. How do we know that this cart will roll on sand? Because we have tested it and these top notch 8-inch wheels will go over the shiftiest of surfaces with ease. That being said, the front wheels are much smaller, and won’t offer much help when it comes to going over the sand, but they will offer greater stability on hard surfaces like tarmac. When you hop onto the sand, just lean the cart backward and use the width of the rear wheels to sail across the beach. The cart holds a total of 75 pounds weight, which means you’ll be able to put a lot of stuff in there. It can hold up to four beach chairs, and all the stuff you need for the beach. But the most important part of this cart is the 32-quart cooler based at the bottom of the cart that will keep your drinks nice and cool. It is also made from extra-durable materials, so it can last for a long period of time. A day at the beach is made super easy with the help of the Wheeleez Heavy Duty Beach Cart. This oversized wheel-barrow like cart, made my list for best beach cart for soft sand due to its simplistic design and durability. You will make a larger investment up front with the Wheeleez but it will lest you forever. Let’s start with the frame. The foldable, marine grade anodized aluminum with stainless steel hardware makes the cart extremely durable and capable of hauling up to 220 lbs. Our test concluded that it is the perfect cart when you have a lot to carry. 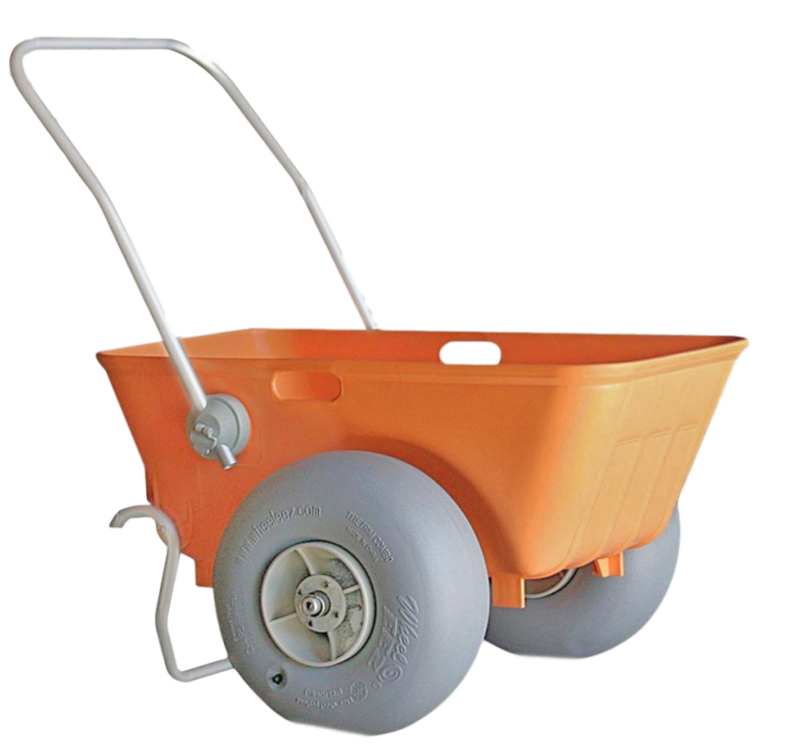 The special patent balloon wheels on the Wheeleez will not sink or plow into soft sand or any other unstable/uneven surfaces. Next up is the mighty All-Terrain Beach Cart.This Tommy Bahama cart is just great at what it does – its spaciousness and weight capacity is just what you need in a cart. It is lightweight so it wouldn’t sink in the sand, and its ten-inch wheels are certain to keep the cart afloat even in the finest sand. The cart also features front wheels for better steering on hard surfaces. The cart has plenty of space for a 48 Quart Cooler, and it sports an insulated cargo bag with pouches on the side, perfect for your cell phone or beach read, it also has an umbrella holder. All in all, the cart holds 100 pounds of gear within 15 cubic feet of space. The Ultimate Premium Cargo Beach Cart by JGR Copa is a classic beach cart that has numerous functions for holding everything from beach umbrellas and tents to lounge chairs and coolers. This cart features extra wide removable wheels that smoothly glide over all terrains, as well as a convenient side sleeve for securing beach umbrellas. Not only is this beach cart lightweight and ultra-durable, it also folds flat for easy storage. It measures just 38” x 25” x 31” and has a total weight capacity of 100 lbs. Mesh sides ensure that any sand or debris that falls into the cart can be easily removed for fast cleanup. If you’re in the market for an affordable and highly functional beach cart, you won’t be disappointed with this option. So glad we finally purchased one of these! With a 600 lb. capacity, the Mighty Max Cart is the ultimate tool for hauling all of your beach supplies. 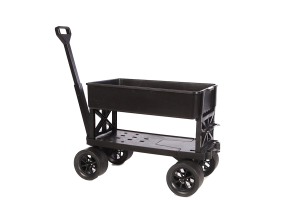 This all-purpose utility and garden cart comes with an expandable flatbed, a pair of removable cargo walls, a removable tub, and a tool rack. The expandable flatbed measures 32” long and has the ability to expand to up to 38” to accommodate pet carriers or large coolers. It also retracts to easily fit into your vehicle. Made 100 percent in the USA, the cart is constructed from special high-impact recyclable resins that are stronger than steel that will never rust and will never need to be painted. What I love about this beach cart is that it can be rolled over nearly any surface. The 4” wide never-flat super grip rubber tires smoothly glide over sand, mud, and even rocky terrains. Best of all, you can get a lot of use from this cart. It’s not just for the beach and garden. You can also take this cart along with you while you go fishing, camping, and boating. It can also be used as a furniture dolly. The cart weighs just 22 lbs. or 27 lbs. with tub and side walls, but is quite powerful. If you’re in search of the ultimate all-purpose cart, the Mighty Max Cart is it. Durability: Your beach cart will likely be hauling a variety of beach gear, including heavier items like coolers and beach umbrellas. You’ll want to ensure that the cart frame is constructed from a durable material, such as aluminum. Multiple Pockets: Pockets may seem like a minor feature, but they can have a big impact on the function of your cart. Many people use pockets to hold their car keys, phone, and other small items. Portability: While most beach carts are portable, not all are easy to use. Choose a cart that easily folds up and can fit in the trunk of your vehicle. When folded, the beach cart should be compact so that it can be stored without wasting too much space. 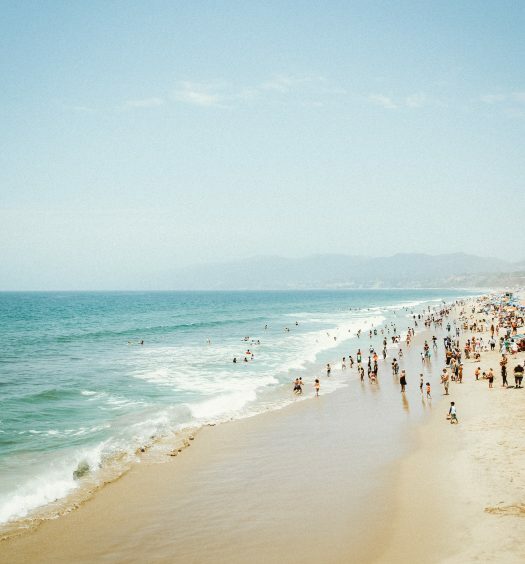 Easy to Clean: As you’ll be using your beach cart near sand and water, you’ll want it to be made of a material that’s easy to clean. 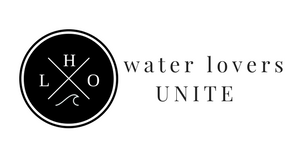 Opt for a breathable, fast-drying fabric that can be cleaned with a wet cloth or with a rinse from the hose.